Why can't I type any more in a cell when it looks like there is room? Please note - Internet Explorer is currently incompatible with Calendar Builder and Print Service Portal. Please use a modern web browser like Chrome, Firefox, or Edge. You may receive an alert "There is not enough room in the area you are typing for additional content. Please remove or resize the existing content if you’d like to add more." when attempting to type into a calendar cell. While it seems like you have room, there are likely hidden characters and/or line breaks in that white space. This happens often when copy and pasting our of Microsoft Word or other third-party files where you sourced your text from. 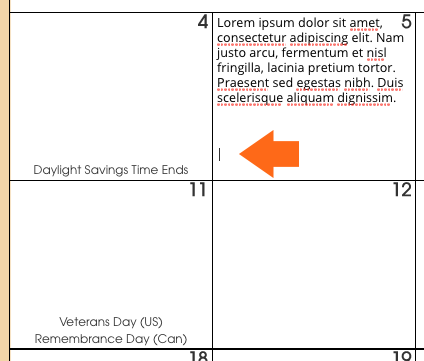 To resolve the issue, simply navigate your cursor to the empty space below your text and hit delete until you are at the end of your last line of text. You should then be able to type until the cell is full.